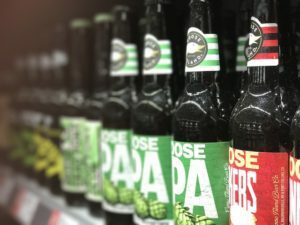 Modern beer drinkers are a unique group of people that view their beverage of choice as more than just a glass of grain alcohol. They see beer as a taste experience. They are not alone. Today’s coffee connoisseurs are very much the same way. It turns out that these two groups of imbibers have something in common: millennials. Yes, it’s true. The oft-maligned millennial is the common denominator between the modern craft beer and third wave coffee movements. Gone are the days of Joe Sixpack and Java Joe. They have been replaced by Mitch Microbrew and Larry Latte. If you are old enough to remember the Nixon presidency and the end of the Vietnam War, you are also old enough to know that the beer and coffee scenes have changed considerably since then. Back in the old-school days of the 70s and 80s, beer was marketed to blue-collar workers looking to grab a cold brewski after work or hang out with friends on the weekends. Back then, the hardest decision a beer drinker had to make was bottle or can. Coffee drinkers were not much into different flavors, cappuccino, or latte back in the day, either. Coffee was fuel for them. And it wasn’t just for people going off to work. Homemakers brewed a pot every morning to get them through a grueling day of housework. It could be said that beer and coffee was limited in the past by the willingness to spend, or the lack thereof, among consumers. People were not willing to spend a ton of money on beer and coffee; they saved the big money for wine and champagne. Beer and coffee were cheap, utilitarian beverages. Then millennials entered the picture and changed everything. Millennial consumers are willing to spend as much on craft beer and third wave coffee as their parents and grandparents spent on a multi-course meal. Moreover, millennials want an experience. They do not want to sit around the bar drinking a light beer and talking about football. No, they would rather sit at a large oak table discussing the finer points of how the new Verizon guy is better than the old one while sipping a craft beer with fruity notes. Third wave coffee drinkers will not be outdone. Coffee is no longer fuel for the millennial generation. Rather, it is an experience that transcends one’s first kiss, becoming a parent, and realizing you finally made it through a mid-life crisis. Third wave coffee drinkers concern themselves with the subtleties of taste. They are interested in where coffee beans are grown, how they are roasted, and how they are blended together to create a world of flavors only they can taste. To modern coffee drinkers, it is good to be them. Here at Galaxie Coffee, we celebrate coffee drinkers of every generation. Be they baby boomers, Gen X or Gen Y, or even the much-maligned millennials, we have coffee for all of them. And it is all good!